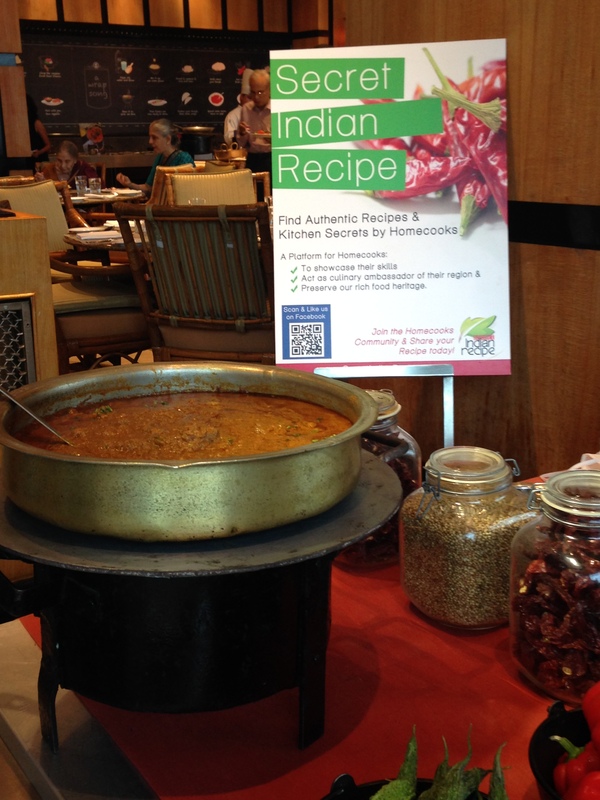 I was absolutely thrilled when I was approached by Secretindianrecipe.com a couple of weeks ago, inviting me to a wonderful event at the Renaissance Mumbai convention center. The focus of the event being a series of cook offs promoting home chefs at the hotel kitchens. It kicked off on Mothers Day in May this year and was proposed for a period for six weeks thereafter .This would mean each participant would have to submit their secret indian recipe that they would like to cook at the hotel kitchen. I knew exactly what my secret recipe was and how I would go about it. 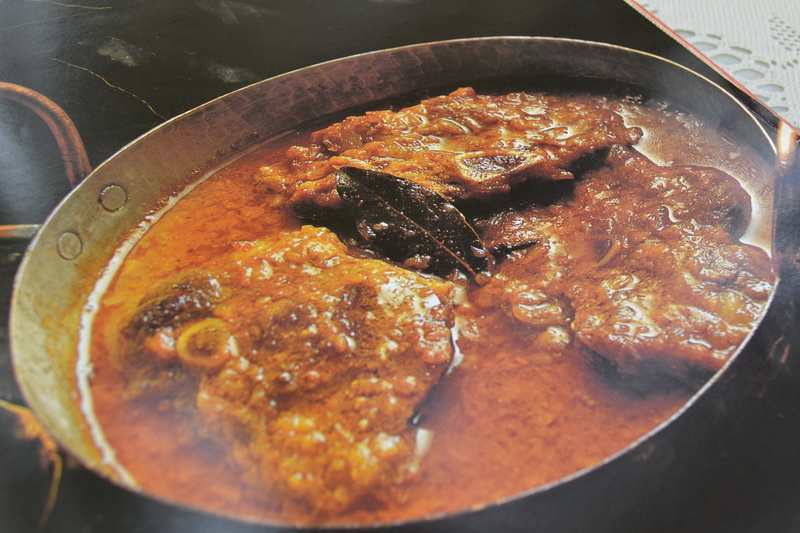 It would have to be the Mutton Kolhapuri that I learned from my Grandmothers kitchen. 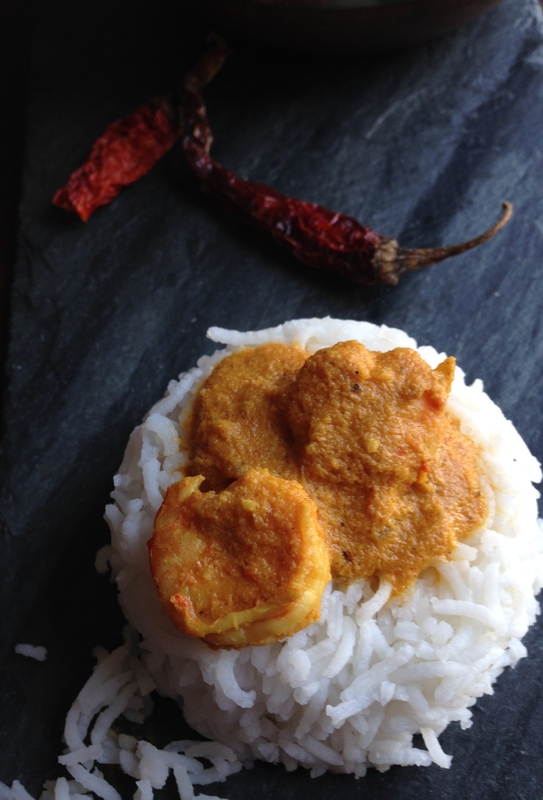 A fiery and aromatic curry and certainly not for the faint hearted. 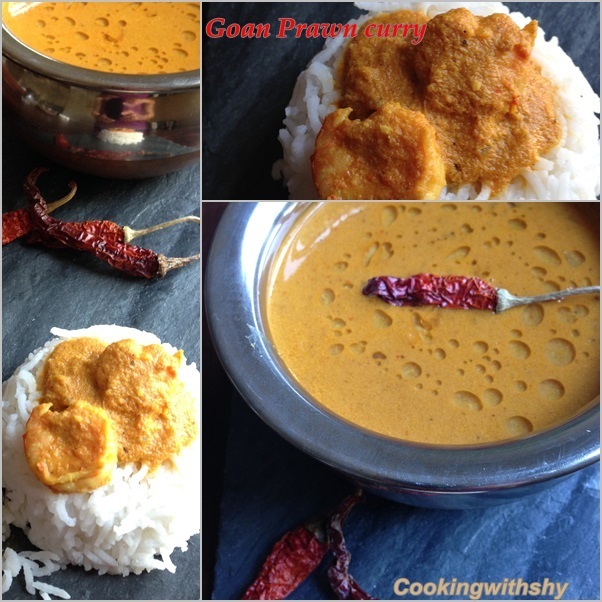 This curry is a lovely coconut based curry with a mix of special spices that are dry roasted and ground together to give it the essence of an authentic Kolhapuri flavor.The thrill of cooking in a hotel kitchen was certainly going to be an experience to remember for years to come. And so I excitedly submitted my recipe for approval. 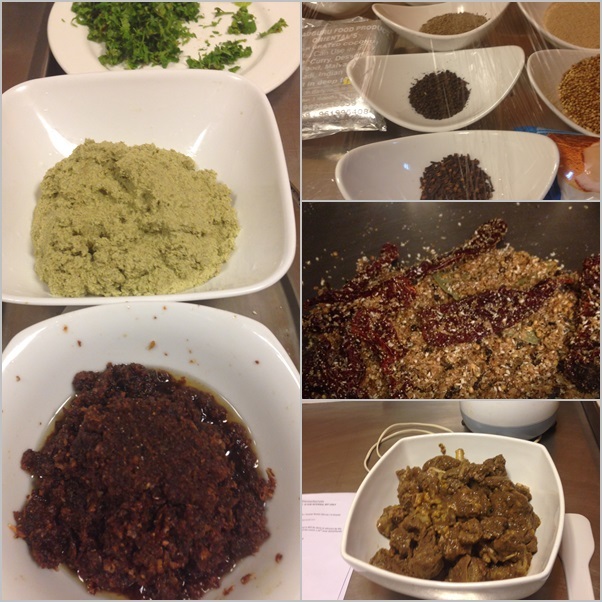 The last few weeks saw a couple of trials in my own home kitchen getting the exact proportions of the masala right. This being the key ingredient in making the Kolhapuri mutton a hit recipe. D-day arrived on June 14th. My chauffeur driven car arrives at 8 am sharp and I soon arrive at the Renaissance. I’m greeted by Executive chef Bijoy and settle down chatting with him over coffee at one of their coffee shops Fratelli. I’m pretty confident that I would be able to handle the day of events as I’m assigned a lovely assistant Chef Pranali who is very helpful indeed. I quickly run through the list of ingredients just to ensure all is in order and get cooking with my recipe for the lunch buffet to be served at The Lake View Café. It’s smooth sailing in the kitchen and in a period of about 3 hours I have a delicious Kolhapuri Mutton ready to be served and sufficient for about 60-70 guests. The guest soon start arriving and my dish has now been set up at a special work station. The restaurant has even printed the recipe sheets for guests so that may want to follow it at home. Many of the guests come and applaud me on the effort and the dish. I’m thrilled to bits when a family that are from Kolhapur taste the dish and give it their seal of approval. 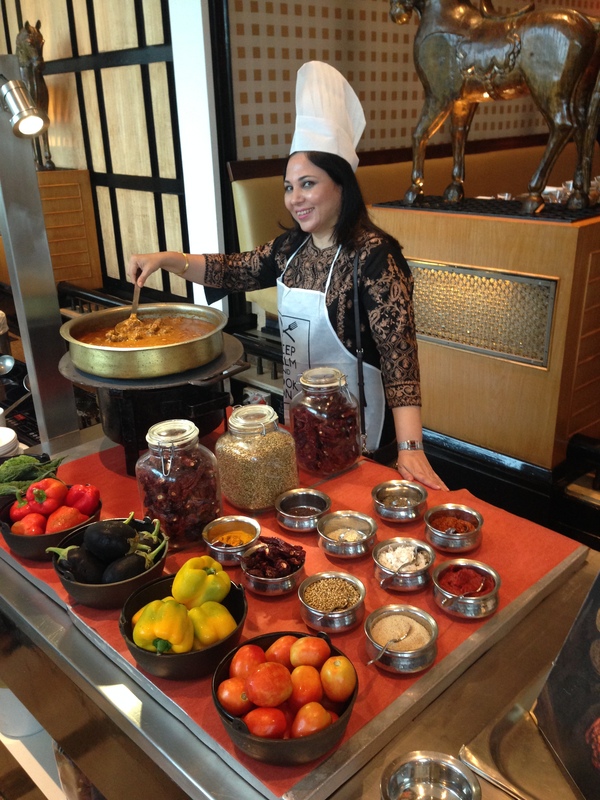 It was a brilliant experience cooking in the kitchen at Renaissance Mumbai Convention Center. 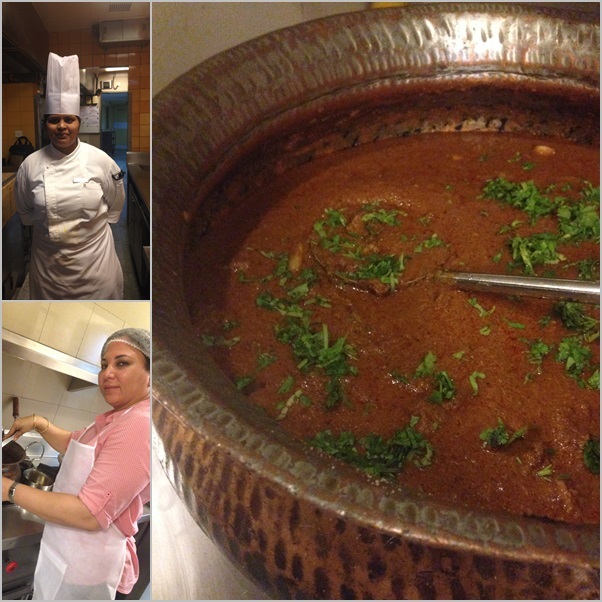 A big round of thanks to Chef Bijoy, Chef Udit and Chef Pranali for all their assistance. Of course a big thank you to SecretIndianRecipe for making this event possible. or you may follow it here as well. Marinate the mutton in ginger garlic paste and turmeric and keep for half an hour. 1) Take a Pan. Add all the spices except red chili powder and nutmeg powder. 2) Heat 1 tsp oil and coat all the spices by mixing well. Roast the spices over medium high heat. Stir continuously to avoid burning. 3) After 5 to 8 minutes, edges of red chilies will blacken, mustard seeds will crackle, coriander-cumin seeds will change color Once you get an aroma of these spices these are done. Do not over roast too much, else the spices will burn. 4) Transfer roasted spices to a big plate. Let them cool completely. Grind it to a fine powder. Add nutmeg and red chili powder. Mix well. 5) Store the masala in an airtight container. 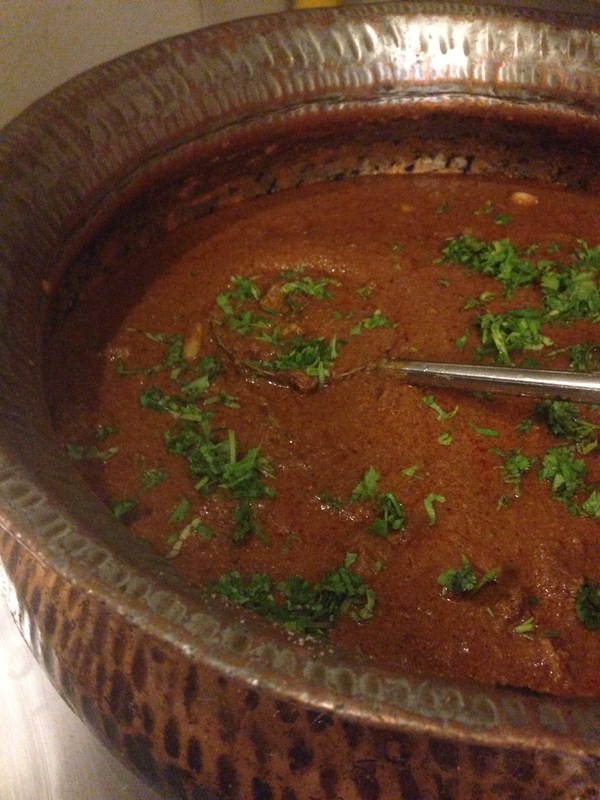 For the Mutton Masala: Wash the mutton well and keep aside. Ensure all the water has completely been drained. Firstly grind the ginger and garlic to a paste and mix it with the turmeric and marinate the mutton with this paste for half an hour. Next heat about half cup of oil in a pan and brown the finely chopped onions. Add the marinated mutton and sufficient water to cover the mutton and let this cook covered for about an hour or pressure cook for 23 minutes. PASTE A: Next dry roast the Poppy seeds, cumin and sesame seeds separately and then mix together. Remove and keep aside. In the same pan dry roast the dry grated coconut till medium brown. And then dry roast the fresh coconut till medium brown. Mix with the seeds and dry grind both the coconut (dry and fresh) and seeds mixture and add a handful of chopped coriander and grind well to a smooth paste. You may add a teaspoon of water to this while grinding. PASTE B: Next dry roast the sliced onions and fry till reddish brown in color. Add a tablespoon of oil in the end. Grind the fried onions to a paste. Next Blanch the tomatoes for about 20 minutes. Peel the skin off and puree them. Heat the remaining half cup of oil. Add the fired Onion paste and fry for a minute or two Next add the fresh tomato Puree and cook till it combines well with the onion mix and it releases the oil. 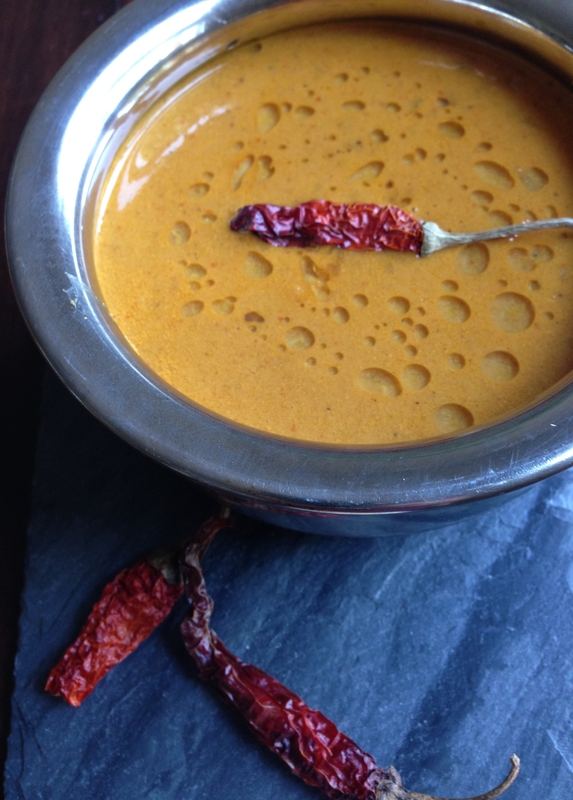 Add a teaspoon of the Kolhapuri masala and fry further. Lastly add the Coconut and seeds paste and mix well. Add some water and cook for 5 minutes. 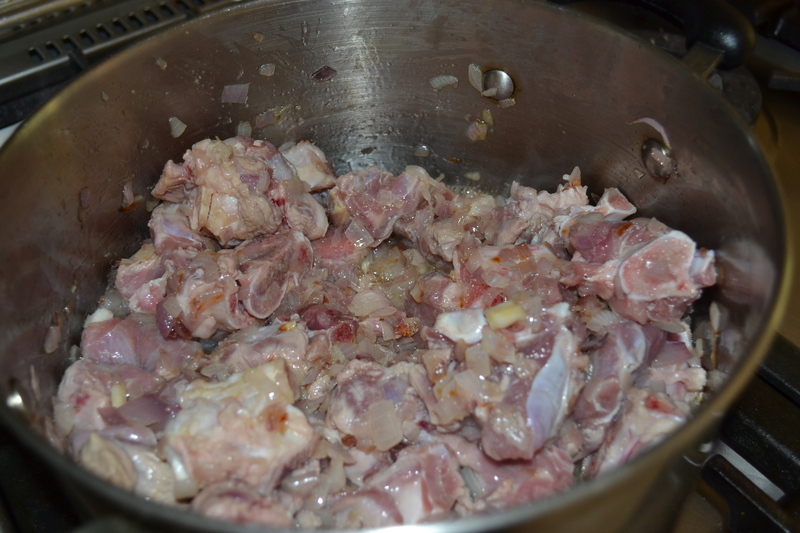 Now add the above entire curry mixture to the cooked Mutton. Add 4 more teaspoons of Kolhapuri masala. (Add more if you want it spicy) Season with salt. Add a little water if the curry is too thick Sprinkle a teaspoon of garam masala and garnish with chopped coriander. I call this curry comfort food.This is really quite simple.Goat meat is generally to make this curry.However you could also use lamb or beef. 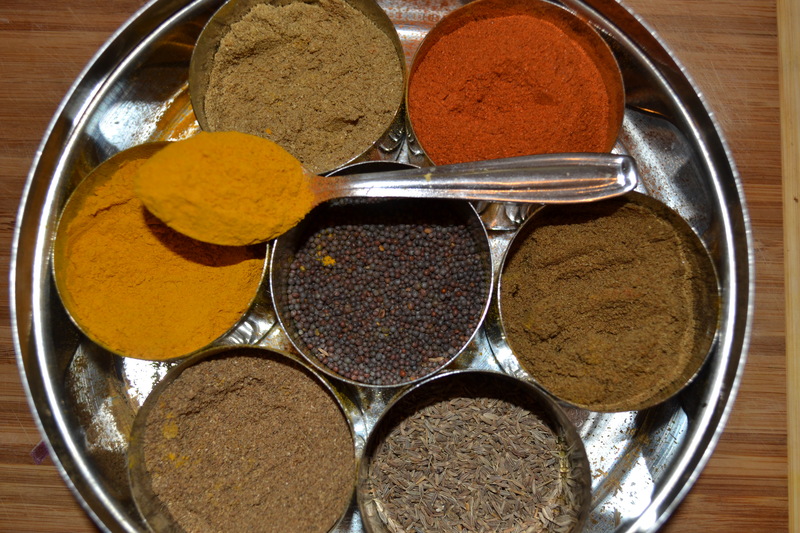 The key to a good curry is of course the quality of the spices used.Ideally one could freshly grind some cumin and coriander.However not always a practical thing to do and so the store-bought one is equally good. 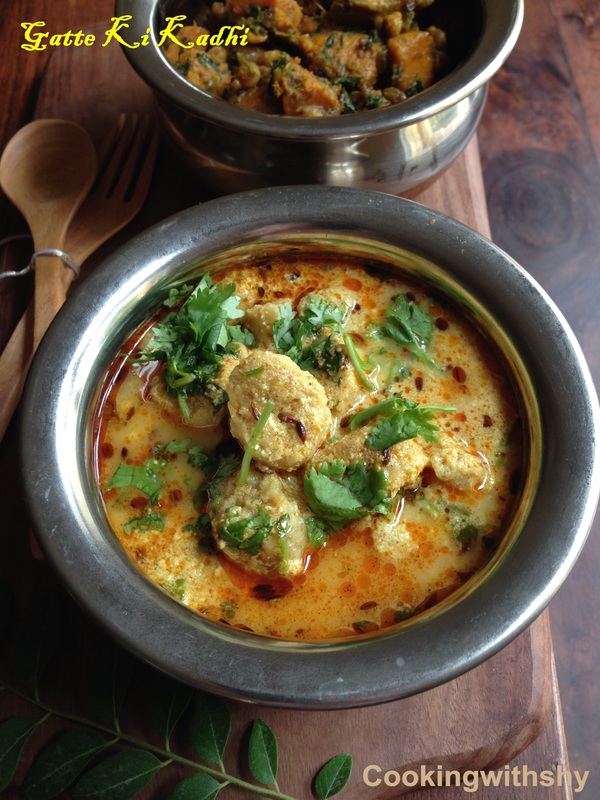 I like to make this basic curry in a large batch as it freezes well.One could always store them in smaller portions in the freezer.This is very handy for most meat,chicken and even a mixed vegetable curry.Accompanined with Rotis,Parathas or even rice…This one is a winner all the way. 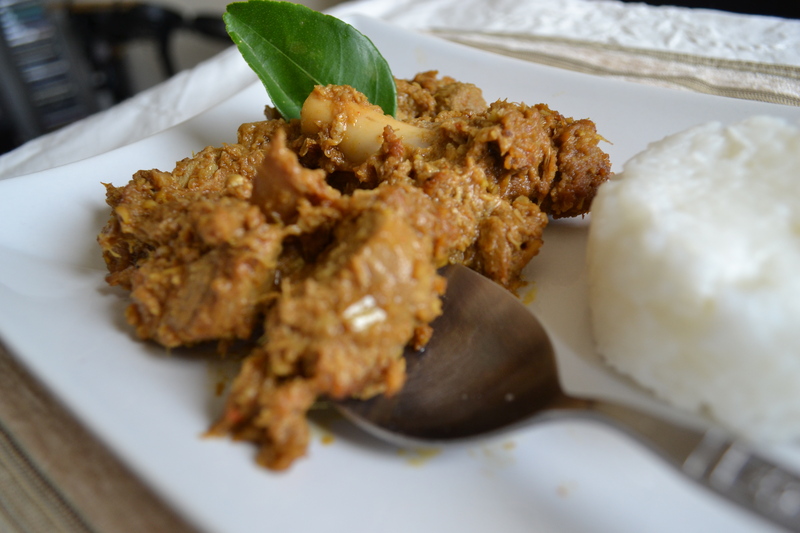 The other tip about cooking mutton is that you need to fry the mutton really well in the begining.After which you could use a pressure cooker.I like to cook this meat the slow cooker way.It takes a good 1-11/2 hours.The meat turns out really tender. 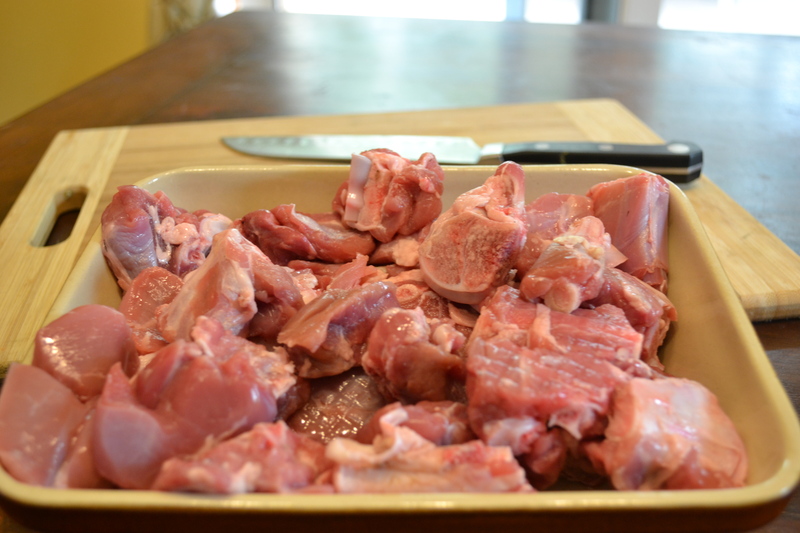 Most often a meat curry would be boneless.I like to use some cuts with the bone in along with the boneless ones.This imparts a lovely flavour to the curry. While frying the onions,make sure you don’t brown them too much.As when the meat is added you would need to fry this for sometime.Browning the onions may cause the mixture to burn and alter the flavour.Best is to brown them lightly.The meat should always be cooked on a high flame for about 10 minutes to seal in the juices.After which you may turn down the flame and fry for a bit more. A must have in every Indian kitchen.The spice box or more commonly know as the “Masala Dabba”.It contains several small stainless steel containers to keep the spices in.Usually has two lids,one inner to keep the spices fresh and ann outer one as the cover. Wash the meat under running water and pat dry. Heat some oil in a large cooking pot and add some cumin seeds.Fry till they crackle. Then add the finely chopped onions and fry till light brown. Now add the ginger garlic paste and fry for another couple of minutes. At this stage the meat can be added.Make sure the heat is turned up high so as to sear the meat and seal in the juices. Fry for about 5-10 minutes and turn down the heat to medium and keep frying for another 20 minutes. Take the yogurt and give it a good whisk and add it to the meat. Keep stirring the meat to prevent it from burning. Add all the spice powder one at a time. If the mixture seems too dry and if it is sticking at the bottom add a dash of water. Now add in the tomato paste and mix well. Lastly add the water.Make sure the meat is covered under water. Turn the flame on low and let tis cook for about 1-11/2 hours or untill the meat is really tender. Lastly add salt to taste and garnish with the fresh coriander leaves.